Kids Lunch Ideas - Enter the Healthy Lunch Recipe Contest - You Could Win a Prize! Back to school time means it's time for kids and parents to think about healthy lunches. If kids eat in the school cafeteria, this is a perfect opportunity to talk about the school menu and making healthy food choices. The best way to make sure kids have a healthy lunch is to have them pack their own lunches even just a few times a week. This is a great chance to get kids involved and get their creative juices flowing. Here are a few tips for kids to pack a healthy lunch. Kids - plan and make your own lunch. You'll enjoy eating your lunch a whole lot more that way. Say no to junk! Try to stay away from candy and soft drinks. Find potato chips and crackers that are baked instead of fried. Be creative and colorful. Use your imagination to make something fun and delicious. Lunch isn't boring. Pack a piece of fresh fruit. Pick a fruit that's easy to eat and in season - apples are great. Stay away from processed fruit like fruit roll-ups. Make sure canned fruit comes in natural juices. Add some veggies. 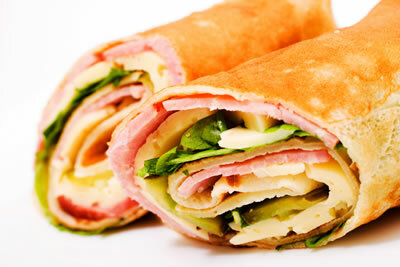 Add shredded carrots and lettuce or chopped olives to your sandwich or wrap. Cut up raw veggies and bring a container of non-dairy healthy dip. Stay away from soggy sandwiches. Pack some canned tuna with a pop-off lid or cheese and crackers. Whole grain is the way to go. Try to use whole grain breads and crackers for a healthier lunch. Leftovers taste great the next day. Cut-up roast (beef, chicken, pork or turkey) makes a great sandwich and leftover spiral pasta is fantastic. Sweet treats aren't so bad if you make them yourself. Bake a healthy cake or muffins on Sunday, refrigerate and take them for lunch throughout the week. And a dental tip: rinse your mouth with water after you eat anything, especially anything sweet. For more ideas, visit the Easy Kids Recipes website. You'll find lots of great lunch recipes and super easy sandwich recipes. 2. Healthy lunch recipe contest - enter now for a chance to win a cool prize - September 10 deadline. The Easy Kids Recipes Healthy Lunch Recipe Contest is underway. If you have a great recipe to share, please submit your recipe. You could win a $50 gift certificate to spend at Toysrus.com. Hurry and enter your favorite lunch recipe. The contest closes September 10. Click here to find out more about the Healthy Lunch Recipe Contest. Have a happy and healthy back to school and Happy Kid Cooking!